Wipe New nano-polymer formula penetrates deep and binds to the surface to permanently restore showroom luster to faded, weathered surfaces and protect against the elements. The surface is permanently protected with a showroom shine that will last as long as you own your vehicle, we guarantee it! 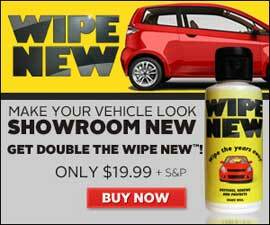 It works wonders on leather, vinyl, plastic, headlamps and more! What Makes Wipe New So Special?